It’s tourney time and once again the Calais girls at 17-1 will go to Bangor with a legitimate shot at the title. The Calais girls and the boys teams have had a lot of success in Bangor over the years, Bob McShane’s great girls’ teams of the 1990’s and 2000’s ended a long championship drought and both the Calais girls and boys have continued to bring gold balls home from Bangor and Augusta. We should mention our neighbors and arch rivals Woodland also have girls’ and boys’ gold balls in their trophy cases. In 1993 the Calais girls beat Erskine Academy 56-36 to bring home Calais’ first gold ball but it wasn’t Calais’ first state basketball championship. 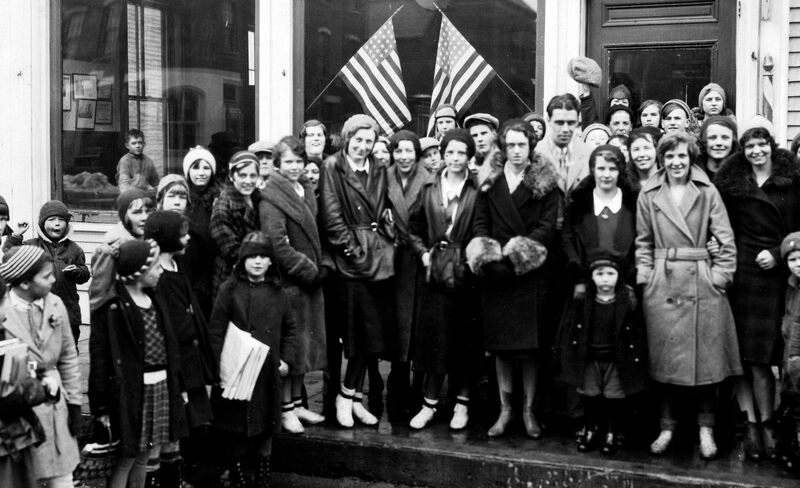 In fact Maine’s first official girls’ state basketball championship game was played in 1931 in Livermore Falls and Calais was the first state champion, easily besting Oxford for the title. The game certainly didn’t generate the excitement of today’s tournaments, the girls stayed in shape for the game by pushing the coach’s car out of snowbanks on the way to Livermore Falls but it was quite a success story for the girls of Calais Academy. 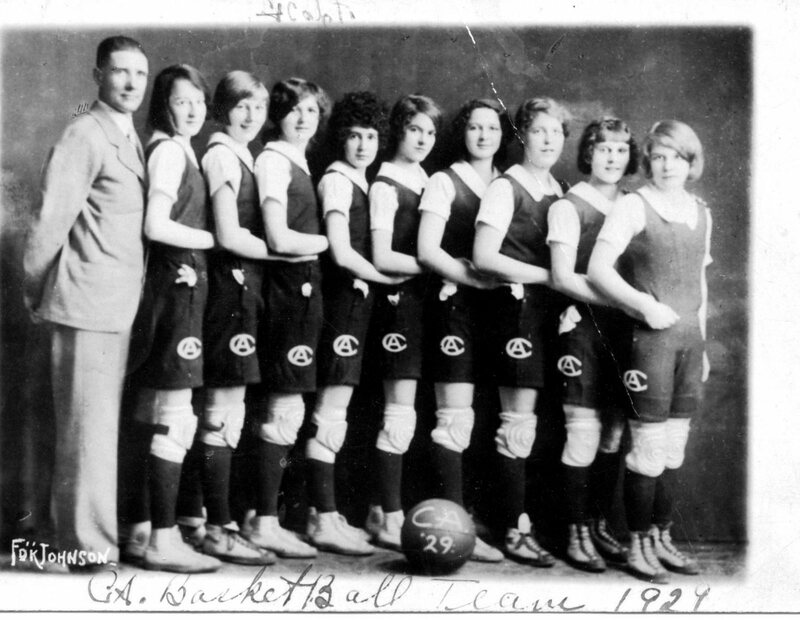 In the mid-1920s a number of area high schools had girls’ basketball teams, Eastport and Machias among them. Calais High, then called Calais Academy, did not have a team but on January 13, 1926 the Calais Advertiser reported that the girls at Calais Academy “have been awakened to the fact that there is splendid material for an ‘All Star’ quintet in the school” and under the guidance of Coach Woodside “they have developed a varsity team that will be well worth watching”. This prediction proved a bit premature as the first girls’ basketball game against Eastport on January 20, 1926 resulted in a 46-11 defeat although, as explained by the Advertiser, “the absence of Miss Charlene Davidson, forward, due to sickness had a great deal to do with the defeat.” We believe Miss Davidson is the girl just to the left of the girl holding the ball the first photo above. Whatever the reason for the trouncing by Eastport, the Calais girls quickly became a powerhouse in state basketball. 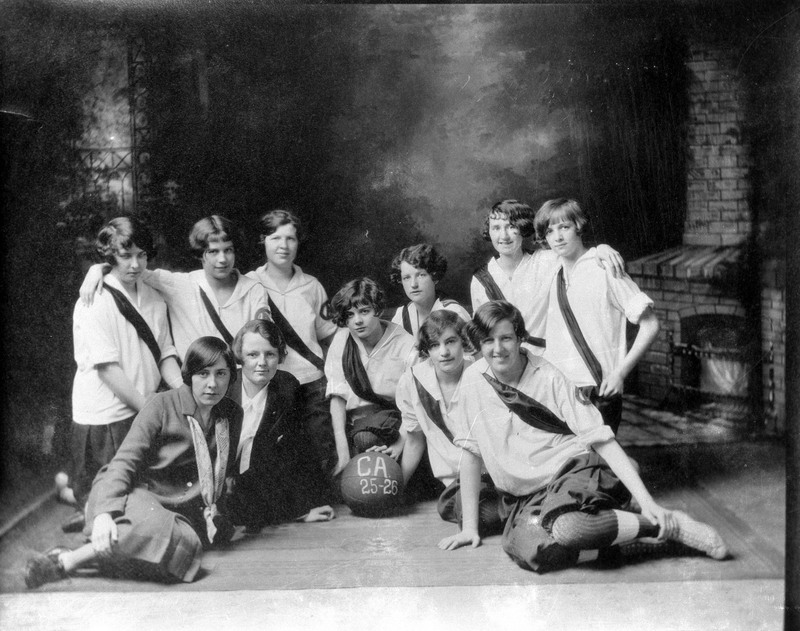 In those days there was no official state title but by 1929 the Calais girls, pictured above, had claimed the unofficial title as state champions. The photo above shows the 1929 team being feted in front of the St Croix Hotel after winning the “unofficial” girls’ basketball championship. 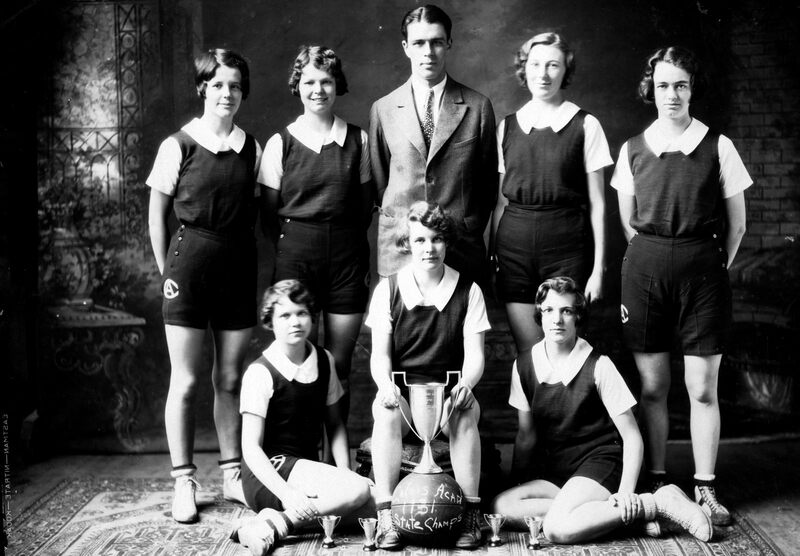 In 1931 high school basketball in Maine was finally organized and the first official girls’ state championship was played in Livermore Falls. Only part of the Calais Academy team could make the trip as the coach’s car could hold only seven players and, even then, two of the smaller players had to sit on folding chairs in the back seat. The trip took two days but, as mentioned above, the players stayed in shape by pushing the car out of several snowdrifts along the way. They easily beat Oxford for the title and were crowned the first girls’ state champions of the State of Maine. 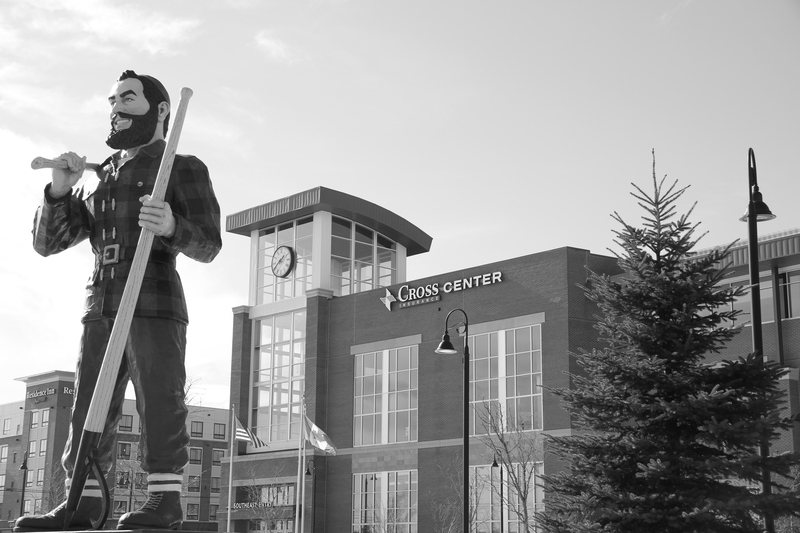 According to an article by Rex Nicholson in the Calais Times in 2000, the tradition of meeting the champions outside of town and escorting the team back to the school began when the 1931 team returned from Livermore Falls. The 1931 team poses above with their trophy and ball on which is written “Calais Academy 1931 State Champs”. An annual Calais Academy basketball banquet was held beginning in the early 1930’s. 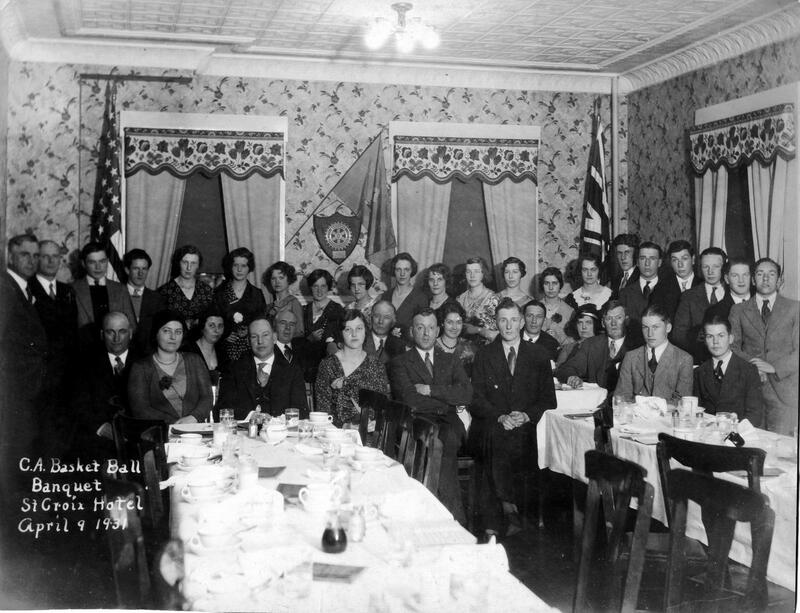 The above is the 1931 banquet during which there was much to celebrate. The St. Croix Hotel, now sadly gone, was the venue for nearly all such events for many decades. 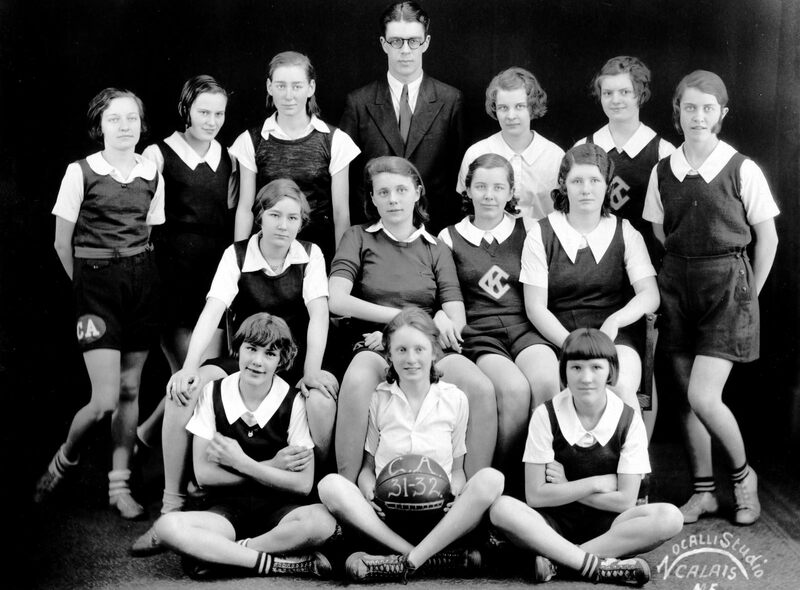 The Calais Academy girls’ team of 1931-32 had few returning veterans from 1931 but continued to play basketball at a high level. However the success of the girls’ teams in those early years was not duplicated until Bob McShane’s squads of the 1990’s. Regardless, basketball teams from Calais High have a long and storied history in the state and we’re sure this year will play, win or lose, with the championship spirit and tradition established by those first teams from Calais Academy.